Over the course of the week we are deeply privilidged to host some of Italy’s most highly experienced instructors. 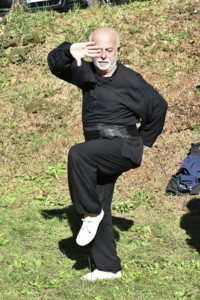 Paolo Chilelli – Imperial Baguazhang (Wang Hanzi lineage), direct student and promoter of Master Zhang Dugan. A professional educator, he is one of the founders of the “International Baguazhang Association” (PRC) and the national chairman of FIWUK Baguazhang College. Under his direction Baguazhang has become the first gongfu style to be offered in the italian school system and was recently presented to the European Parlament in Brussels. 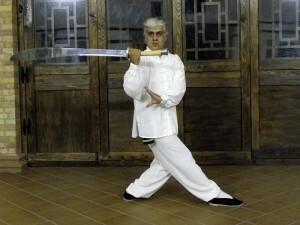 Enrico Colmi – Cheng Tinghua Style, oldest italian and european student of Master Liu Jingru. Former Sport Medicine doctor, he teaches now regularly Chinese Traditional Medicine and his the author of a study on athletes posturology. With master Liu he studied also Xingyiquan and Liuhe Tanglang. Riccardo Ferrara – Liang Zhenpu Style, indoor student of Master Sui Yunjiang since 2001. He teaches Baguazhang from this tradition in Rome through his association WenWu. He studied also Chinese Traditional Medicine and Tuina. 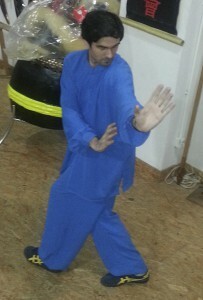 Matteo Buffa – Cheng Tinghua Style, official student of master Liu Jingru. Technical director together wth Sara Ambu of “BaxianKungfu”, since 2006 visits China to study with famous teachers. He also practice Xingyiquan and Liuhe Tanglang. In 2008 won the Orlando (USA) Kungfu Championship in Baguazhang. Mauro Ria – Cheng Tinghua Style and Feng Huang. Technical director of the “Nei Jia Phoenix School” in Rome. He teaches Baguazhang and Xingyiquan (Hebei). Black Belt 5th Duan. 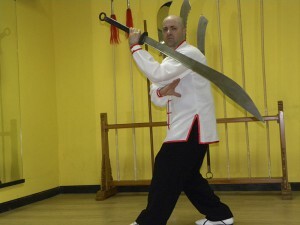 Nikitas Petroulias – Cheng Tinghua Style, inside door student of master Zhao Ming Hua. Master Zhao is acupncture doctor in Chinese Traditional Medicine hospital in Beijing. He collaborates with the European edition of the martial arts journal “Hong Kong New Martial Hero”. He is also member of the “World Traditional Kung Fu Federation”, and chairman for Greece. 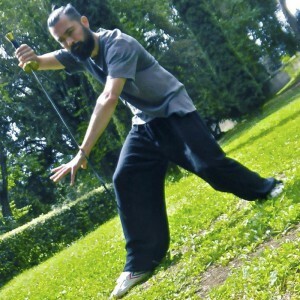 Fabrizio Pozzi – Imperial Style Baguazhang, student of master Zhang Dugan. Started training gongfu at 13, PhD in Oriental Languages, remained years long in China where he studied under master Liu Jingru Baguazhang and Xingyiquan. Once back to Italy, he met master Zhang and studied under him. Technical Director of the “Tao Chi” in Rome. In 2006 Sergio started the study of martial arts with Master Yang Lin Sheng: Tai Ji (Chen Style), Xing Yi Quan, Yi Quan, Ba Gua Zhang. Later he studied the Cheng Ming Style (Wang Shujin School) with Master Paolo Maganato as well as Tai Ji, Xing Yi Quan, Ba gua Zhang and Qi Gong. During the same period he studied also GM. Guo Guizhi’s Da Cheng Quan – Yi Quan. Studying directly also under the direction of GM. Whang Fu Lai and GM. Huang Su Chun gained the international certification for Tai ji and Qi Gong of Cheng Ming School. During these years he also had the possibility to study Taikiken with GM Michio Shimada Sensei. In 2016 started to study Sun Family Ba Gua Zhang with Master Luigi Zanini. In 1999 Simona started her martial arts studies with Master John Shadow: Liu He Ba Fa Quan. Studying with Prof. Li Xiaoming she became an instructor of Therapeutic Qi Gong. In 2002 she started to study Xing Yi Quan, Bagua Zhang e Yi Quan with M. Yang Linsheng and Liu Chunyan. Then she started to study Taiji Quan (Chen style) with M. Xiaowang and M. Zhu Tiancai. In 2006 she started to study Xing Yi Quan, Bagua Zhang and Yi Quan of Cheng Ming style (created by Wang Shujin)with M. Paolo Maganato. In 2012 she gained the 1st place for Tui Shou and reached the 4th place for TaiJi form in international tournament in Taiwan. Today she is teaches Martial Arts, Yoga, and Pilates. 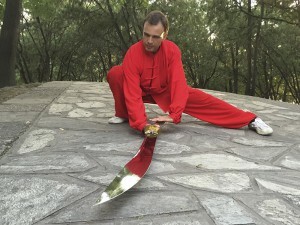 Step in the circle of Wang Su Chin Style and first change movements. First application of Ba Gua routine and hidden link between Ba Gua and Qi Gong (first form of Cheng Ming school). All teachers are members of the Techical Panel of FIWUK Italy.